Ibrance is the brand name for the generic drug Palbocilcib. This medicine belongs to a group of a second generation cyclin-dependent kinase inhibitor (CDK) 4/6 inhibitors. Palbociclib is used in combination with letrozole (Femara) as an initial endocrine therapy for the treatment of human epidermal growth factor receptor 2 (HER2) and hormone receptor (HR) positive breast tumors in adult cancer patients. It is also approved in combination with fulvestrant in patients with progressive disease receiving prior endocrine therapy. Ibrance alone is used to treat Advanced (metastatic) breast cancer. In combination with other medications used to treat HR-positive breast cancer. Also used to treat HER2-negative advanced or metastatic breast cancer. Cancer cells grow uncontrollably. Ibrance is an inhibitor of cyclodependent kinase (CDK) 4/6. A kinase is a type of protein in the body that helps control cell division. CDK 4/6 inhibitors work by disrupting the kinase and preventing cancer cells from dividing and developing. It is approved only for menopausal women. However, it is important to know that pregnant women or those planning pregnancy should not take this medicine. It is important that you do not become pregnant while taking Palbociclib. You must use an effective contraceptive method while you are taking it and at least two weeks after the last dose. Women who are breastfeeding or who intend to breastfeed should not take Palbociclib. Together, you and your doctor will decide if you want to take it or breastfeed. Allergy to palbociclib, another medicine or any of the ingredients in palbociclib capsules. Tell your doctor and pharmacist what herbal products you are taking, especially St. John’s wort. Tell your doctor if you have an infection or if you have or have liver or kidney disease. Talk to your doctor about your medical history, especially about neutropenia. Hypersensitivity reactions to this drug or any other ingredients. It is contraindicated in fungal infections. Take this medication with a meal prescribed by your doctor. Usually once a day for 21 days. Then take the medicine for 7 days. This is a treatment cycle. Continue taking this medication as directed by your doctor. Swallow the capsules whole. Do not crush, chew or open the capsules. Do not carry any broken or damaged capsule with you. If you vomit after taking it, do not take another dose of the medication that day. Take the next dose at the usual time of the next day. The recommended initial dose of Ibrance is 125 mg once a day with food for 21 consecutive days, followed by 7 days without treatment. IBRANCE should be taken with food. When used concomitantly with Ibrance, the recommended dose of fulvestrant is 500 mg taken on Days 1, 15, 29, and once monthly thereafter. Please consult the complete dosing information of fulvestrant. The dose depends on your health status, your laboratory tests, your response to treatment and other medications you take. Be sure to tell your doctor and pharmacist about all the products you use (including prescription drugs, over-the-counter medications, and herbal products). If you notice any side effects, your doctor may stop your treatment for a while or reduce your dose. Talk to your doctor to get more information. Use this medication regularly to make the most of it. At the same time, take it at the same time you take the medicine so you can remember it. Do not increase your dose and do not use this medication more often or for longer than expected. Your condition will not improve faster and will increase the risk of serious side effects. You should not take a type of medicine called a CYP3A inhibitor because it increases the effects of this drug. You should not take with a herb like St. John’s wort, because it can decrease the effects of Ibrance. You should not eat grapefruit or pomegranate or drink grapefruit juice or pomegranate juice because they can increase the effects of this medicine. 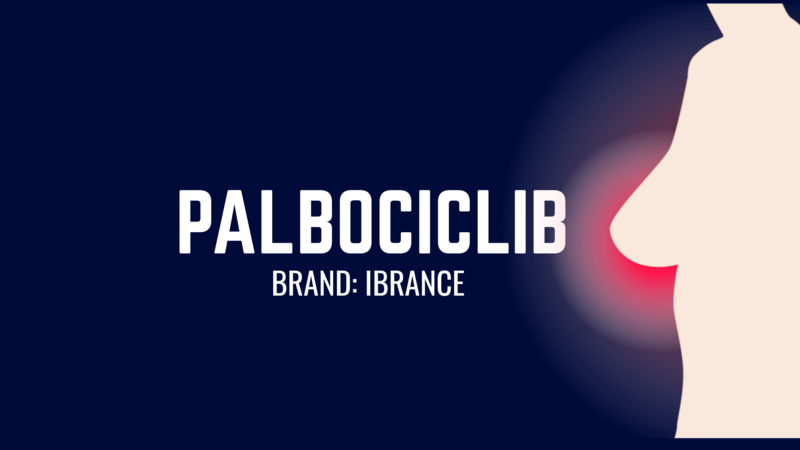 Ibrance (Palbociclib) is a prescription drugs and belongs to a group of a second generation cyclin-dependent kinase inhibitor (CDK) 4/6 inhibitors. 2. What is Ibrance used to treat? It is used in combination with an aromatase inhibitor such as Femara for the treatment of advanced or metastatic breast cancer, which is positive for the hormone receptor, HER2-negative, which has not been previously treated in postmenopausal women with hormone therapy. It is also used in combination with fulvestrant for the treatment of HER2-negative advanced or metastatic breast cancer, with positive hormone receptors grown after hormonal therapy in postmenopausal women. 3. How long can you take Ibrance? It is taken orally during a 4-week cycle as a daily dose. In the first 3 weeks (21 days) take an Ibrance pill once a day. 4. How does Ibrance work? Ibrance is an inhibitor of cyclin-dependent kinase (CDK) 4 and 6. A kinase is a type of protein in the body that helps to control cell division. The cancer cells grow uncontrollably and Ibrance works by interfering with the kinase to prevent cancer cells from dividing and growing. 5. How to take Ibrance? It is taken orally once daily with an aromatase inhibitor or fulvestrant. You should take Ibrance at about the same time each day and swallow as a whole. If you forget or vomit a dose after one dose, take the next prescribed dose at the usual time. 6. Should Ibrance be taken with food? This medicine should be taken after the meal. 7. What should I avoid when taking Ibrance? If you are being treated with this medicine, do not take Ibrance for the treatment of other conditions, Unless The doctor instructs you. Do not share this medicine with third parties, even if they have the same condition as you. Do not Lower the dose without consulting your doctor. 8. Is there a generic for Ibrance? Yes it is a brand and the generic is Palbociclib. It belong to a group of drugs known as cyclin-dependent kinase inhibitor (CDK) 4/6 inhibitors. 9. What are the side effects of Ibrance? The common side effects are nausea, diarrhea, vomiting, loss of appetite, dry mouth etc. while serious side effects include Upper respiratory infection, Low blood counts, Fatigue. 10. Is Palbociclib a form of chemotherapy? Palbociclib is used to treat a specific type of breast cancer in women. It is a chemotherapy that slows down or stops the growth of cancer cells. 11. Can I use the Ibrance tablet when I’m pregnant? Women who are pregnant or planning pregnancy should not take Palbociclib. Doctors do not know if Ibrance harms her baby before birth. It is important that you do not become pregnant while taking Palbociclib. 12. Can I use Ibrance while breastfeeding? Women who are breastfeeding or who intend to breastfeed should not take Ibrance. Your doctor will decide together if you want to take Ibrance or breastfeed. 13. What happens if I forget a dose of Ibrance? Skip the missed dose and continue your regular dosing schedule. Do not take a double dose on the same day to make up for the missed dose. 14. What is the dose for the Ibrance? 15. How to store Ibrance? Keep this medicine in the container where it is well closed and inaccessible to children. Store it at room temperature and away from excessive heat and moisture (not in the bathroom). 16. What happens if i overdose on Ibrance? Call your doctor or the poison information center immediately. Do this even if there are no signs of discomfort or poisoning. You may need urgent medical attention.